All portrait deniers of the Carolingian Kings are scarce to rare. Size: 17.6 x 19.6 mm. Weight: 1.49 grams. Reference: MEC vol 1, #758. Grade: good Fine but with a ragged flan (the ragged area does not have a sharp edge that one would expect if a coin broke after striking, so I believe it was struck on a ragged flan). Nicely toned. Obverse: Portrait of Louis the Pious right, with HLVDOVVICVS IMP AVG around. Reverse: Minting tools, with METALLVM around. 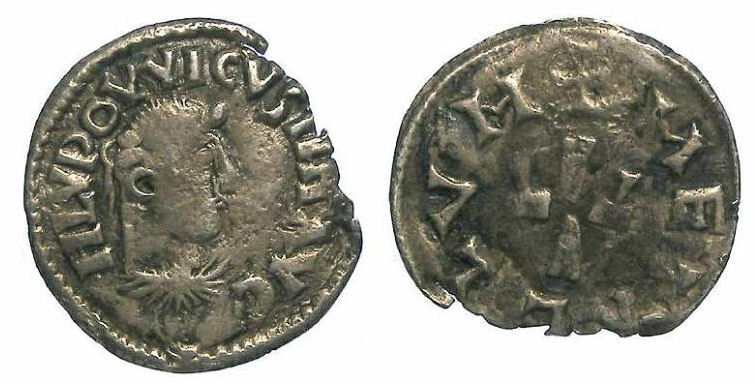 This is a particularly interesting type for Louis the Pius, in part because it has his portrait, but also because the reverse shows dies and hammers, representing the medieval minting tools of that time. Henry VI, AD 1422 to 1453. Denomination: Silver grand blanc aux ecus. Mint: Paris (mint mark crown). Date: second type issued after the 6th of September 1423. Size: 26.6 x 26.9 mm. Weight: 3.46 grams. Grade: gVF and nicer than the image suggests. Obverse: Shields of France and England, with the Virgin Mary and the angel Gabriel above, with HENRICVS DEI GRA FRANCORV Z AGILE REX around. Reverse: Latin cross flanked by a fleur-de-lis and a leopard, with an h below, all in a tressure of ten arches, with XPC VIHCIT XPC REGHAT XPC IMPERAT around. Richard I, AD 943 to 996. Silver denier. Richard I, known as Richard the Fearless, came into power in Normady upon his fathers death in AD 942 at the age of 8 to 10 years, but Louis IV of France immediately seized Normady and put him in confinement. With the help of other Norman and Viking leaders, Richard escaped and reclaiming Normady in AD 947. Size: 18.7 x 19.3 mm. Weight: 1.06 grams. Grade: gVF with some weakiness on some of the lettering, and the lettering is crudely engraved, as is normal for this issue. 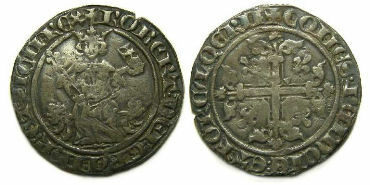 Obverse: Short cross with a pellet in each quadrant, with RICARDVS around. Reverse: Monogram of Bishop Hugues, with ROTO MAGVS around. Hugues was Bishop of Rouen from AD 942 to 989. This Richard has no connection with Richard the Lionheart of England, predating him by more than 200 years. While very similar to the his Italian issues as King of Naples, this coin was struck in France as Count of Provence. Denomination: Silver Gigliato (or Carlini). Size: 23.8 x 24.3 mm. Weight: 3.48 grams. 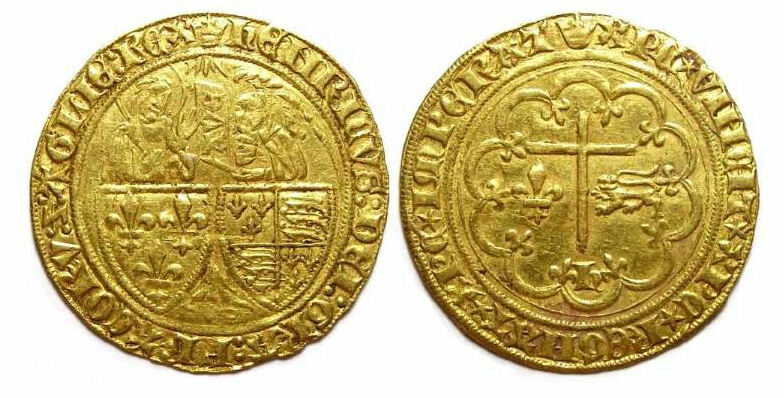 Obverse: Robert seated with a lion to each side, and holding a globus cruciger and sceptre, with ROBERT DEI GRA IERL ET SICIL REX around. Reverse: Cross fleurée, with a lis in each angle, with COMES PUINCIE ET FORCALQERII around. Things are always changing in the world of Medieval coin collecting. The fall of the iron curtain brought many Eastern European coins to the markets in large numbers, making some previously scarce types readily available and inexpensive, but some other issues, including many Crusader coins, are now difficult to find. It is possible to build a good representative collection of medieval coins, but it takes time and patience. The coinage of medieval France is extensive and very interesting. The feudal issues were struck by local and regional authorities, mostly for use in the immediate area of issue. The Royal series, struck in the name of the King, was for use over a much wider geographic area. Between the two series, there are thousands of issues.